Our favourite gaming headset just got better with 7.1 digital surroundbut it's also driven down the price of its predecessor, so choosing between Cloud models is a tough call. The best thing about the Kingston HyperX Cloud, our favorite gaming headset, is that it’s actually a rebranded Qpad QH-90. Kingston took an already great headset and made it even better. I won't tell you they turned everything up to 11, because I'm not a hi-fi salesman. But if I did, you'd get a decent understanding of the grand plan. The comfort was already there, thanks to Qpad. Wisely leaving all the building materials and architecture untouched, but for occasional splashes of its own branding, Kingston instead focussed on pushing for a more aggressive, bass-heavy sound that didn't compromise clarity. The HyperX Cloud was—and is—a complete success, and still one of the absolute best gaming headsets available. Given that nothing was really wrong with it, it's perhaps a bit surprising to see the HyperX Cloud II turn up so soon. The visual differences are null (save for a redesigned inline remote), but there's one key feature to set it apart from its predecessor—surround sound. 7.1 virtual surround sound, driven by 53mm units in each earcup, to be precise. 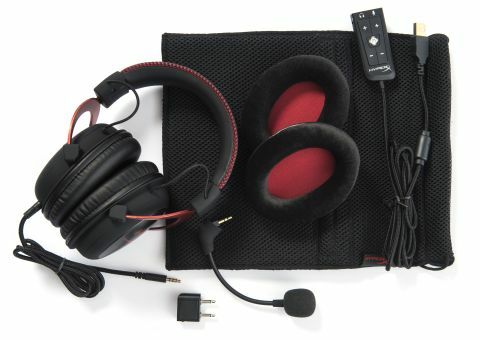 The previous HyperX, like the Qpad QH-90, had a simple two-channel stereo output by contrast. So although it was capable of many things, precise positional audio and cinematic 'sweeping' sound effects were off the menu. Is it a big deal that the Cloud II offers seven, algorithm-driven sound sources instead of two? The answer's totally dependent on your intended usage. If you're sitting there with the old model clasped to your skull feeling like your hardware's now redundant, don't. You still own the most comfortable cans available, with incredible sound quality whether you’re listening to music or bullets and bombs whizzing overhead. Unless you take your online FPS gaming really seriously and want to know exactly where those footsteps are coming from in CS:GO, you can breathe easy—you’re not missing out. Perhaps the more relevant question is whether those who don’t own the original HyperX Cloud should consider the Cloud II a no-brainer. In short: no. Firstly, the release of the Cloud II has pushed down the price of its wonderful predecessor to under $70, some $30 cheaper than the new model. That’s pause for thought no matter how interested you are in surround sound. Secondly, the quality of that surround is good, rather than great. There are clear pros, as you’d expect from Kingston: its interface requires a single USB slot rather than the morass of coloured cables required to set up a ‘true’ surround headset, and it’s toggled on or off via the press of a button on the inline remote. That’s actually an important feature when listening to audio designed for a 2.1 setup, because you’ll want to turn surround mode off in that case for clearer, more precise sound quality. Leave it on—as with any surround headphones—and you’ll hear a muddiness when listening to a stereo source. Turn it on when listening to an audio mix engineered for 7.1 though, and you’ll really hear the benefits. The hard work’s already done by the Cloud II’s fantastic bass response, accentuated by its construction materials and closed cup design, and by the clarity offered higher up the EQ. So when you hear a sound passing from behind and over your head, it’s all the more impressive for having that low-end body. However, if you separate the overall sound quality from the quality of the surround itself, it doesn’t stack up against Creative and Turtle Beach’s high-end 7.1 offerings. Admittedly, models such as Creative’s Tactic 3D Omega and Turtle Beach’s Z300 require a more complex setup, both involving a weighty soundcard that’ll have to live somewhere on your desk, so the Cloud II’s got convenience on its side—but not definitive surround quality. It’s only natural to expect that much of these Kingston cans, given the superlative foundations they’re built on and the sky-high standard the memory manufacturer evidently sets for its peripheral offspring, and it’s for that reason this updated model deserves such close scrutiny. The Cloud II might not be the smashing success Kingston hoped for, but it’s important to re-emphasise what an incredible package this is for under $100. If the older model wasn’t available for $30 less now, we’d recommend it unreservedly. As it is, we have to add a few provisos. If you have $100 at your disposal and you’re looking for a catch-all headset at home with movies, games, and music—with something extra in the tank to make anything Michael Bay or Treyarch sound a bit more impressive, this is your headset. If you’re looking to save a bit of cash and know you’ll be happy with a simple stereo setup, hunt down the original Cloud, which is now available at a killer price.